Only 24 hours until my new car arrives....it's a GTR! Discussion in 'Motors' started by NathWraith, Jan 31, 2019.
the supra will be miles behind the GTR. Driving enjoyment and fun on the UK road however it may offer something the GTR does not been around 250-300kg lighter and RWD, plus its a 10yr newer platform. But after a GTR going to something lesser performance wise will always be hard indeed. A corner sofa with Huracan drivetrain? Good answer, although I think the GTR's on a different level in terms of raw performance. Yeah for sure. It's a different type of drive though. Great choice. Really like that colour too - enjoy! Btw, if you want to be added to the whatsapp groups for the big 2 owners groups, drop me your number. Great looking car. But then I am biased. Love the colour. If ever I was to sell mine (which hopefully won't happen) then I would consider GREY again or ORANGE. Y PIPE WILL lead to more mods. Guaranteed. Thanks. Wow that is serious power. One thing I have noticed is that most quoted "stage 1" is what the stock MY17 puts out BHP wise anyway. Mine is a CBA 09. Registered early April 2009. One of the 1st GTRs. Health check carried out, everything was spot on apart from ball joints. But it wasn't a concern for them, marked as AMBER. When I get on the PC I'll post up the graph. So a week into ownership, I thought I'd write up a little summary of how I'm getting on with the car & how it compares to the previous C63 (6.2). I've done just under 400 miles and sadly majority has been motorway due to work but that will change soon. When everything is set to R mode and you are running through the gears, the GTR feels like a ballistic missile with a race car sound track. Unbelievable. The package of the engine & drive train is just perfect. The AWD systems knows exactly how much power to put(or pull) where and it feels as if you can guide the GTR through bends with just mind control, it flows so well. If you haven't driven a GTR then you really need to. I had been test driving lots of exotic cars prior to this and none of them really felt this in tune with the road under power. Set the transmission to R and knock it into manual and off you go. Never touched the TCS, probably won't! The transmission & drivetrain can be heard clunking & swapping cogs, you never feel it but can be heard. You very much are aware that you are in a machine and I like that. The car when in it's performance modes really does goad you on to do more and it just takes it. There isn't a wasted bit of BHP, the ruthless efficiency of it is mind blowing. All the toys you need, none you don't. I've never been a huge fan of "new driver tech" such as adaptive cruise, integrated apple play/android, wireless charging, WiFi hots spots etc as they simply are not relevant to my interests. Comfy heated power leather seats, nav, bluetooth, cruise control, parking sensors/rear camera & auto wiper/lights is more than enough for me. However for the price I'm sure other buyers would be disappointed that there isn't more interior goodies. Few meh areas are lack of folding rear seats, a locking system that sounds like it's from the 90's (probably is) & no "coming home light function". Not deal breakers but you will notice these if you have had them before. Unsurprising news here, that despite all the new changes to the GTR, it is is still miles behind on refinement. This isn't the point of the car of course and is more than acceptable considering what performance is on offer. Having 6 gears means it sits higher in the rev range around 70-75MPH whilst cruising. Exhaust is very quiet even with the valves open and at normal driving speeds the car doesn't sound like anything special at all. It's only once in the latter half of the rev range do things begin to sound fruity. The adaptive dampers are amazing. I never bother with normal mode, either R or comfort and the difference really is night & day. Comfort on the motorway is slightly smoother than the C63 whereas R gives you plenty of feedback. A big annoyance is the level of tram-lining the car delivers with the stock Dunlop GT600 tyres. This was noticeable on the test drive GTR (different car) too. You really do have to be awake on the motorway to avoid shimmying into other lanes. What I will say is that they do offer outstanding agility & grip when pressing on. Being run flat is a blessing and a curse. No spare tyres means they may get you out of a pickle but also make the ride slightly harder than alternatives (so I'm told). I'm taking the car to Donington on the 27th Feb so will get a chance to really stretch it's legs. 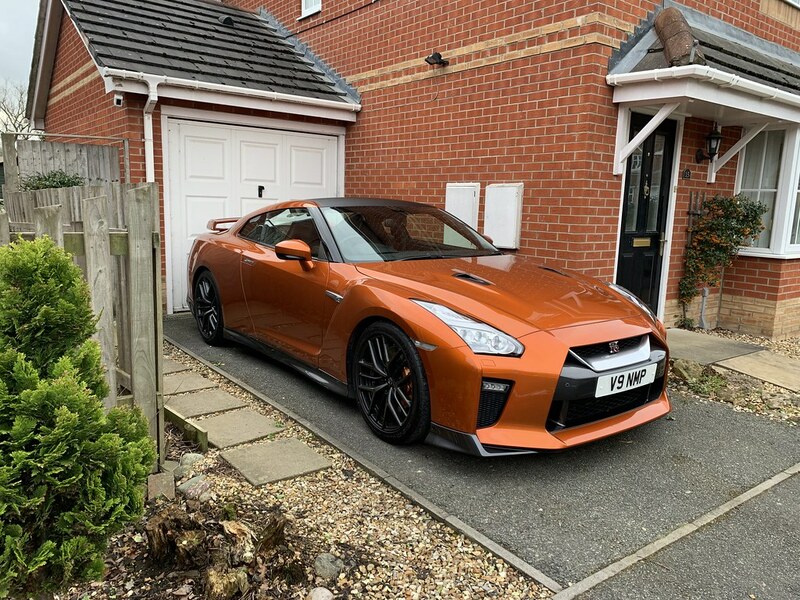 "The ability to drive with such impunity, at such insane rates, means the GT-R’s only real problem is its adrenalin induced addictiveness and the threat of a lengthy spell at her majesty’s pleasure." When youve used them and move to something like a Cup2 or MPS4S youll notice how the car transforms in this regard. Being run flat is a blessing and a curse. No spare tyres means they may get you out of a pickle but also make the ride slightly harder than alternatives (so I'm told). Agreed about the tyres - MPS4S in 265 / 305 combo work really well. Never been a fan of Dunlops on any car I've had let alone run flats. Yep 100%. The more I drive the car the more I am looking forward to switching out the tyres! Getting used to the car as a whole now which is nice, feels more natural to place on the road and familiar in general. The reactions & comments I have received have taken me by surprise, in a good way! Lots of comments at the petrol station & at home washing the car which has been nice. Plenty of smiles & thumbs up from fellow motorists on the road too. Only one example of a chav in a knackered mk4 golf trying to "race" me, I just ignored them and they sped(lurched) off. Dont think I ever had a negative comment about mine, they are certainly a fan favorite, it really is a commanding presence and people just move out the way for you (I found anyway). When you go to stage 4 or 4.25 its much more fun obliterating them to embarrassment A stock will obviously win, but when you have that extra power and torque its just silly giggles. Plate now on and another coat of liquid crystal. Absolutely amazing stuff. Would recommend. Thanks for the lift, though I've being in an MY17 before, it was only a few weeks ago I was in Kindai stock 2009 GTR (he put back to stock) and the performance difference between the two is staggering, his car felt slow, we even commented on how slow it felt, whereas your 2017 felt as quick as when Kindai's was tuned, get it to Santa Pod in the Summer mate, be very interested to see what it runs without LC, but the newer cars are certainly a big evolution of the older cars power and ride quality wise, plus the interior is in another league. Great car, enjoy it and the colour really makes it a proper stand out, even in our short trip people coming over to chat about it. No worries mate. Glad you enjoyed it! Aha yes even the kids on the estate went by earlier “look at that GTR!”. Nice feeling knowing it’s such a well received car. So keen for the track day next week now. I feel like having my plate completes the package. Totally forgot about that noble chair though! Ooops, we shall sort the noblechair next time. That looks stunning, easily the best colour. Had a good look around an MY19 in Nissan yesterday and it a nice thing in pearlescent white. They had a brand new one £10k off (Think it was £77k), but whilst nice, that's still a lot. Only thing missing was apple carplay.